Enbridge estimates a worst-case crude oil spill in Minnesota from its proposed Line 3 pipeline would cost about $1 billion to clean up. It’s a staggering number. What’s worse, Enbridge’s analysis is flawed, making self-serving assumptions that allow it to low-ball the costs of a catastrophic rupture. Enbridge filed its thin, seven-page report Tuesday with the Minnesota Public Utilities Commission (PUC), analyzing the costs of a worst-case spill. Among its most glaring errors, Enbridge failed to recognize any of the unique impacts a major oil spill would have on Anishinaabe people. It also made favorable assumptions about Enbridge’s response time, lowering the cost estimates. Enbridge’s report on clean-up costs has major flaws. 1. Enbridge fails to acknowledge the unique impact a crude oil spill would have on the Anishinaabe peoples of northern Minnesota. Enbridge’s worst-case spill report doesn’t use the word “Indian,” “Anishinaabe,” or “wild rice.” Wild rice is sacred to the Anishinaabe. Both the PUC and Enbridge have repeatedly ignored Anishinaabe treaty rights to hunt, fish and gather along lands Line 3 would cross. A major tar sands crude oil spill could damage wild rice beds, a traumatic event to Anishinaabe people with huge cultural costs. Comment: The PUC should not accept Enbridge’s report without a detailed explanation and price tag for how Enbridge would address the spill impacts on wild rice and the Anishinaabe peoples. Enbridge shouldn’t be allowed to pretend the cultural impacts are $0. Though alarms sounded in Enbridge’s Edmonton headquarters at the time of the rupture, it was eighteen hours before a Michigan utilities employee reported oil spilling and the pipeline company learned of the spill. Meanwhile, pipeline operators had thought the alarms were possibly caused by a bubble in the pipeline and, while for some time it was shut down, they also increased pressure for periods of hours to try to clear the possible blockage, spilling more oil. Comments: The PUC should not allow Enbridge to calculate its worst-case scenario spill assuming a best-case scenario response time. Its track record mean more than its promises. 3. The PUC didn’t allow the public the opportunity to challenge Enbridge’s numbers. Enbridge’s unhelpful graphic depicting how people would die if a crude oil spill ignited. The report never says how many people would die. If the PUC were truly interested in an objective cost estimate to clean up a major crude oil spill, it would have requested it early in the Line 3 review process — when the public could still review and comment on it. Instead, the PUC tacked the requirement on well after the public hearing closed. This allowed Enbridge and Enbridge alone to define the terms of the debate. Enbridge’s analysis runs barely seven pages, using irrelevant graphics as filler. It offers generalities to explain how it developed its estimates. It discusses a major spill with sterile terms, such as “Consequence Assessment” and “population receptors,” the kind of language to make your eyes glaze over. It avoids terms like “drinking water contamination,” “pollution,” or “natural resources damage.” The report failed to acknowledge that tar sands crude is heavy and sinks in water, meaning it never gets completely cleaned up. Comment: The PUC let the public down. It allowed Enbridge to define the clean up costs of a major spill without being challenged. 4. In a bizarre twist, Enbridge adds its own “reputational damage” from a major spill to its clean-up costs. Enbridge’s estimate of worst case oil spill from Line 3. Clean up costs includes damage to Enbridge’s reputation, which accounts for 28 percent of total damages, according to Enbridge. Reputational costs aren’t out-of-pocket cash. They’re a red mark on the corporate embarrassment ledger. Considering the various scenarios, Enbridge’s average reputational costs at around $400 million. That means the company only has to provide Minnesota with financial guarantees for $1 billion worth of actual clean up costs for a worst-case spill (not the $1.4 billion that gets the headlines). Particularly galling, Enbridge is able to put a price on its own reputational losses while failing to acknowledge — or offering to compensate for — the reputational harm done to Minnesota and affected communities should Line 3 burst and gush tar sands crude into a major river. 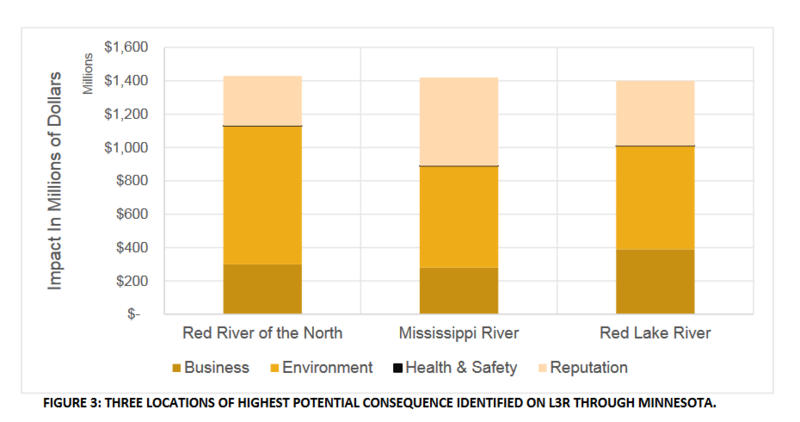 Reputation consequence quantifies in dollars the impact on Enbridge’s reputation and is a function of the calculated volume out, health and safety receptors, other sensitive areas, and business receptors that may be impacted in the event of a release. Each identified receptor is assessed a score and the sum of all scores for a given pipeline is the reputation multiplier which is used against a fixed reputation value. Comment: OK, that makes no sense whatsoever. It certainly doesn’t let the reader know how Enbridge came up with a $400 million reputational loss. It seems odd that Enbridge would add its reputational costs to this analysis. Here’s one cynical explanation why. 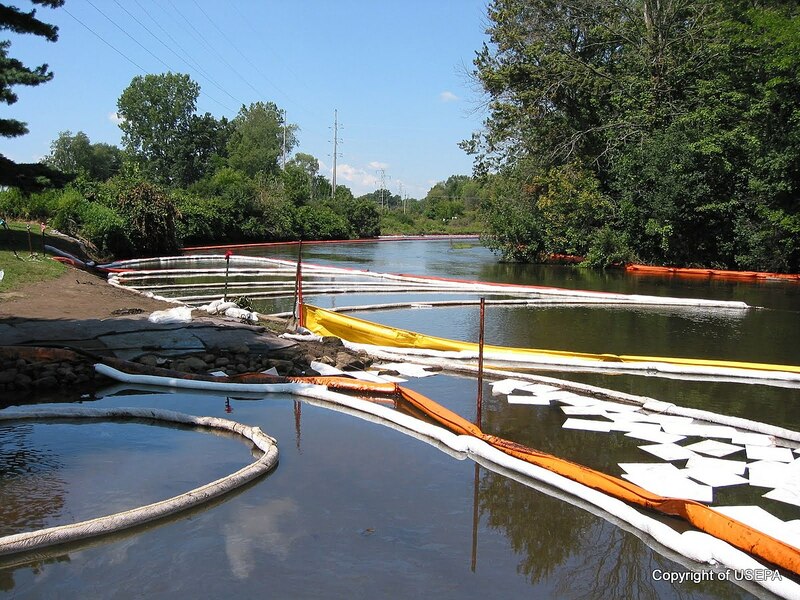 Getting the total clean-up costs from a major Line 3 spill to hit $1.4 billion would conveniently put it on par with the actual clean-up costs for Enbridge’s 2010 Kalamazoo River spill. (Wikipedia says the clean-up costs there hit $1.2 billion by 2014, with another $219 million in anticipated costs. That’s $1.4 billion.) It wouldn’t look good for Enbridge to offer the PUC a worst-case scenario for a Line 3 spill where the clean-up costs were lower than the actual costs from an Enbridge spill eight years ago from a smaller pipeline. Bottom Line: If the PUC accepts Enbridge’s report, it will be one more example of how the Commission is bending over backwards to favor an international business over the interests of Minnesotans.